Have you ever wanted to go out to dinner, but didn’t have a babysitter? 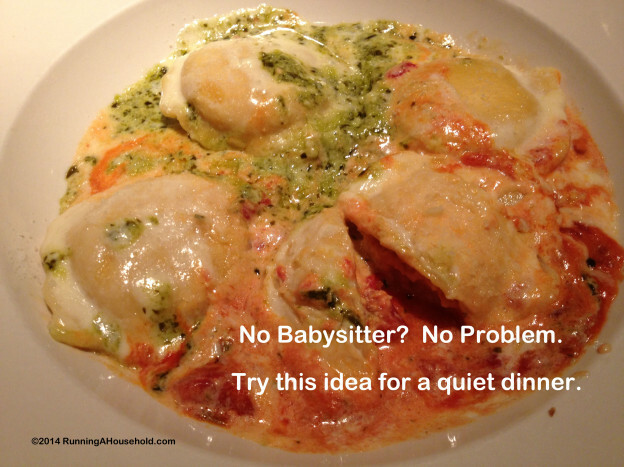 Consider this idea for having a relaxing dinner without a babysitter. One night, we had our hearts set on a chicken parmesan dinner from our favorite Italian restaurant. Our babysitter wasn’t available, nor was her back-up, so we planned to bring the kids with us. Normally, this isn’t a problem. However, that afternoon they were exceptionally loud, active, and uncooperative. Going out to dinner was no longer an option. So we decided to get our meals to go. In our case, the only thing that changed was that we were not going out to eat. We were still getting our chicken parmesan meals from a nice restaurant. Tip #1: Order a nice, fancy meal. This will make your dinner feel special. The key to making this work is to order great food, instead of the usual take-out items like pizza, grinders or wings. Tip #2: Set the table. To make your dinner at home special, put a table-cloth on your table. Be sure to use silverware, and put the food on your nicest plates. No shortcuts here. You might be tempted to just eat right out of the take-out container, but taking the time to use your dishes will make dinner more enjoyable. Tip #3: Consider ordering your take-out meal after the kids go to bed. In our case, we sat with our kids while they ate their dinner. After they ate, our older child agreed to read a book, while our youngest played blocks. We thoroughly enjoyed our dinner, without the hassle of bringing the children out to eat. However, if you don’t think your kids can play or read quietly, plan to have your dinner after they go to bed. Tip #4: Plan to have your cocktails at home. There’s no need to skip the alcoholic beverages, especially since you’re staying home. So plan ahead, and have a bottle of wine or some margaritas. Feeding children at home is much more economical than bringing them out to eat, especially if you would normally order a separate meal for each child. You can also save some money on wine and beer. Let’s face it, we all know that for the price of two glasses of wine at a restaurant, you could buy an entire bottle of a really good wine, and have some left over. Beer can be expensive, too. For the price of two beers, you could buy a six-pack. Although we would have preferred to have a babysitter watch our children so we could have a quiet night out, we did save some money. To be honest, our take out meal cost less that what we would have paid the babysitter for the night. So the next time you don’t have a babysitter, consider ordering take out. Just be sure to order a great meal, and set the table accordingly. 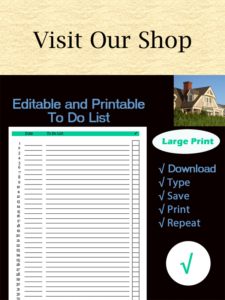 This entry was posted in Meals and tagged babysitter alternatives, dinner without babysitter, no babysitter, what to do if babysitter cancels on October 4, 2014 by Running A Household.